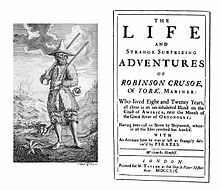 The book is a fictional autobiography of the title character, Robinson Crusoe. Crusoe leaves the safety of his comfortable middle-class home in England and goes to sea. He is shipwrecked and becomes a castaway who spends years on a remote tropical island near Trinidad. He meets cannibals, captives and mutineers, and is eventually rescued. For the first edition, Defoe pretended that the novel was a true story. He said the fictional protagonist Robinson Crusoe was the author and he pretended to be the editor of Crusoe's autobiography. :vii This led many readers to believe that Crusoe was a real person and the book a true account of his life. Many people think the story was influenced by the life of Alexander Selkirk. Selkirk was a Scottish castaway who lived for over four years on a Pacific island belonging to Chile called Más a Tierra. (In 1966, the island was renamed Robinson Crusoe Island.) However, there are other possible sources. For example, Ibn Tufail's earlier novel Hayy ibn Yaqdhan, also set on a desert island, may have inspired Defoe. Robinson Crusoe was very popular as soon as it was published. Before the end of 1719, it had already run through four editions. :xxv The novel's popularity has continued and it has become one of the most widely published books in history. It has prompted many imitations and adaptations for stage, film, and television. ↑ "Robinson Crusoe (novel by Defoe)". Encyclopædia Britannica. Encyclopædia Britannica, Inc. Retrieved 2013-11-11. This page was last changed on 16 September 2018, at 20:37.